Traditional Kashmiri thali consists of Wazwan, which demands lot of preparation. Infact, preparing Wazwan in itself is considered a great art. Lot of time and effort is spent on the making of this special feast. The cuisine of Wazwan has near about 36 dishes. The head chef known as Vasta Waza does all the requisite preparations. It is mostly prepared on some big family occasion or festivity.This compromises mainly of non vegetarian dishes.I have created a vegetarian thali selecting their best and most popular dishes. Kashmiri ‘s use a lot of turmeric and yoghurt, garlic and onion are not used much as in the case of other Indian cuisines. Other spices used to add to the taste are dry ginger and saunf (aniseed).. Kashmir being the leading producer and chief exporter of saffron makes an extensive use of this to add color and flavor to most of their dishes. Kashmiri dishes make a regular use of dry fruits in their dishes.The curries, rice, even the chutneys have dried fruits to make them rich.They use ghee to cook meals, though in urban areas, well educated families have started using mustard oil as an alternative, to avoid the intake of high fat in ghee. I am not new to Kashmiri cuisine as there is lot of similarity between Kashmiri and Punjabi food.A few spices differ which change the taste completely.We cook a lot of Raajma and the small red Jammu ke raajma are really sweet in taste.The big sized Raajma is made by the Punjabis. Dum Aaloo has lot of versions , but I like the version that I make where I stuff the potato with paneer, khoya and nuts.The gravy too has a nutty flavor. Methi Chaman is the popular paneer dish with fenugreek..a little saunf changes the flavor of this amazing green.The soft cottage cheese cubes just melt in the mouth. Kashmir, as we all know has a beautiful lake and so they have production of Lotus Stem, which is used extensively in their cooking I have made some Kebabs from these Lotus Stems and filled Aam Papad in these deep fried pattys. They have a variety of rice to serve, I prepared white rice with fried onion to go with the Raajma Rismise, but I could not resist cooking the Meethe Chawal which are full of nuts , paneer, saffron and cardamon. I served Kashmiri Roti with the curries. This roti has a amazing flavor of spices, which are roasted and then pounded. The dough is binded with milk. Coming to the accompaniments, I prepared Doon Chetin which is such a wonderful chutney and Walnut Chutney , this can also be used as a dip with some oriental fare. The Al Raita is mild , soothing and cooling. The Fruity Salad is simple blend of dry fruits as well as fresh fruits.And now coming to the recipes….. Prepare the lotus stem..check here. In a big bowl, mash the lotus stem and potatoes. Add ginger, green chillies, red chilli powder, cardamom garam masala powder, salt, roasted chana powder (or breadcrumbs) and coriander leaves and mix well. Divide into sixteen small balls and stuff each ball with a piece of aam papad and shape it like a patty. Heat sufficient oil in a non-stick pan and shallow fry all the patties until golden on both sides. Pressure cook raajma with five cups of water and salt till soft. Heat oil in a deep pan. Add bay leaves and onions. Add raajma along with the cooking liquour and mix. Sprinkle garam masala powder. Not forgetting the sweet…the Kashmiri Shufta is served with most meals…but I prepared Phirni which is an all time favorite with most of us in the house. Garishing it with saffron ,fresh rose petals and nuts this surely is a grand finale to this rich meal…and to this wonderful Thaali event at BM. 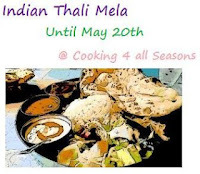 For the next week I shall feature some of the Thaali Recipes…so do come back. I loved all your thalis and the information you gave about each thali. I will look forward to the recipes in the coming days. Awesome Vaishali..that's a great way to end this fantastic week..thanks for taking time in doing so much work! will be looking fwd to read the recipe..
You have picked a lovely state to end the week long run…it is as beautiful as the state. You had the most entertaining and enagaging spreads of all..I will be making the waltnut chutney tomorrow out of this. And I will be visiting all the thalis at leisure again.. Everyday u rock Vaishali, am so excited to see all ur dishes sometimes most of the foods u shared are truly new for a SOuth Indian like me..Thanks for all these wonderful feasts you shared with us..
everything looks amazing..I actually did a paper on Kashmir when I was in culinary school and that was when I learned how to make Rogan Josh, but most of these dishes are totally new to me. I have a year's worth of recipes from all the thalis this week…and your presentations are always superb!!! Awesome spread! never tasted kashmiri cuisine..all the dishes sound wonderful..looking forward to few more recipes next week! Hats off to you Vaishaliji!!!! This is indeed is a Grand Finale for all the Thali Treat's you served us all this week!!!! Looking forward to rest of the recipes next week!!!! No words to describe the feast that you served up for this week. This one is no exception. Every one of those dishes look absolutely fantastic. Moreover I'm gonna blame you for the weight that I've put on for simply looking at your menus each day (just kidding;)…super super super…you simply rocked each and every day of this week. Hmm lovely platter n its new to me, i never tasted such food n names r new to me really tempting meal dear…Sounds interesting! !